Your American-made Bench*Made Maple Side Chair, Arm Chair, Bar Stool, & Counter Stool is master crafted in solid hardwood, in any of four classic styles, 16 stunning finishes, and 16 chair seat options (shop in-store for even more including leather and upholstery.) Dimensions by chair style: Baxter 19"?Wx24"?Dx37"?H, Boone (single slat) 19"?Wx23"?Dx42"?H, Greyson (ladderback) 19"?Wx23"?Dx42"?H and Henry (Spindle) 19"?Wx23"?Dx42"?H. Seat height is standard 18"?. Artisan Dining hardwood timber is carefully harvested in the Appalachian Region of the eastern United States, selected for its natural beauty and wood grain character. Bassett"?s master craftsmen hand-plane and apply the rich finishes that give these treasures timeless appeal in your home. Bench made (meaning individually created and produced), these are built to stand the test of time and be the centerpiece of your family gatherings for many memorable occasions. Handcrafted in Virginia. The maple hardwood timber used for our Bench*Made Artisan Dining collection is carefully harvested in the Appalachian Region of the eastern United States, selected for its natural beauty and wood grain character. Bassett"?s master craftsmen hand-plane and apply the rich finishes that give these treasures timeless appeal in your home. Bench made (meaning individually created and produced), these pieces are built to stand the test of time and be the centerpiece of your family gatherings for many memorable occasions. Collection includes benches, huntboards, rectangular dining tables, arm chairs, side chairs, rectangular and round farmhouse tables, Georgian tables, tavern tables, credenzas, saddle stools, counter stools, and bar stools. Handcrafted in Virginia. 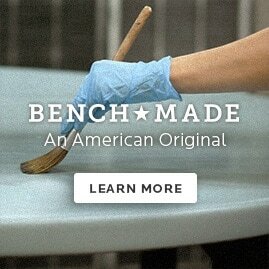 Proud to be American made.